WHY BUY A HOUSE IN SAN BASILE? A secondary house in San Basile means a relaxing and peaceful place in the middle hill, below mountains and having a beautiful sea view easily within reach before returning to the town's peacefulness and coolness. A place to take refuge in every time it'd be necessary, just to live a few days or months in a very different and new way of living. But a house in San Basile may also mean the alternative for people who whould establish here a permanent residence for economic reasons (i.e. 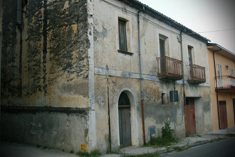 retired people, who may sell a city house to buy another cheap one in San Basile and enjoy the saving or may rent a house in the old town; young married couples, who may solve their buying dwelling house problems in big cities choosing a more reasonable price in our town), for ill health reasons (i.e. getting away from the city pollution to breath good air and eat natural food), or finally for a simple own choice (i.e. no chaos, traffir or stress, but long walks, upstanding idleness and amusement activities to take back relationships with others and themselves). It is also possible to rent a piece of land in which plant a vegetable garden: it seems to be a dream, but it can be easily done without spending a lot of money. In addition there are few farmhouses that can be used for a pleasant stay in the nature world of the Pollino National Park. There's also a camper and caravan area suitably equipped for campers. Young people instead may enjoy their time in summer taking part in the events and activities (sports, knowledge, fun) all together.